You can download the ROBOTILL Install file from the ROBOTILL Download page. One install file is used to install everything (all the modules from the free edition and the full edition). ROBOTILL runs on Windows 7, 8 and 10. On Windows 7 you might need to install the .NET Framework 4.6.1 - the install program will notify you if this is needed. If you get an error that the OS is not supported for the .NET Framework, run your Windows Updates. Once your computer is up to date the framework will install. If you have any problems with the installation, please contact ROBOTILL Support. If you only have one computer that will be your till (POS Computer) and back office computer (used for reports, setting up stock, importing stock, changing print layout, etc. ), then you can skip this section and go down to 'Installing the ROBOTILL Server'. If you will use multiple computers on your system all of them will need to be connected to the same network (LAN / WIFI). You will then need to choose one that will be your ROBOTILL Server. It does not need to be the back office computer but one that will always be in the shop/restaurant. If for example your back office computer will be your laptop that will not always be in the shop/restaurant, then it is better to make one of your POS points the server. If your back office computer will also always be in the shop/restaurant, then it would be better to make your back office computer the server. The server is basically the computer where all the data will be stored. The other computers cannot work if the server is not on the network. Note: If you want to use multiple computers and you do not want to use a local network, then you can let ROBOTILL work over the Internet. See Using a Cloud Server. You first need to install ROBOTILL on the server before you install the other computers. Run the setup.exe file in the RobotillComplete.zip file. After you completed the install, open ROBOTILL Manager (there will be an icon on your desktop). ROBOTILL will detect that there is no database and the ROBOTILL Database Setup Wizard will start. If you will use only one computer select 'Single Computer Installation'. If you will use more than one computer select 'Server Installation'. If you now only have one computer but might add more computers later, you can also select 'Server Installation'. Click on 'Next'. Select 'Let the Wizard Download and Install'. If you have a 64 Bit computer you can select the 64 Bit option. The default option (32 Bit) will work for both 32 Bit and 64 Bit computers. To check what you have, right click on 'This PC' on your desktop and click on Properties. 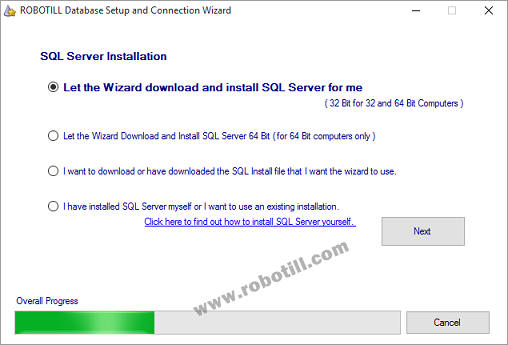 The wizard will download and install SQL Server (this might take a couple of minutes). If the download fails or if the computer you install on has no internet connection, see 'Install without Internet'. 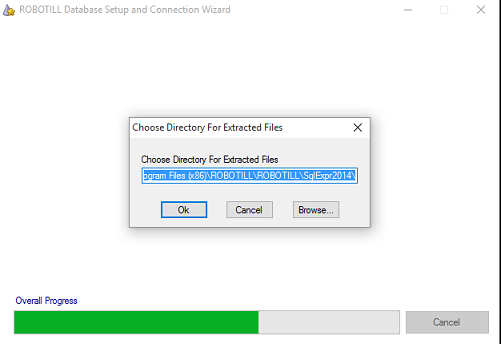 You will be asked where you want to extract the SQL Server install files. You can just accept the default folder. The Wizard will install SQL Server. This can take a couple of minutes. After the wizard completed the install it will open ROBOTILL Manager again. Click here to see how to install on additional computers. Contact ROBOTILL Support if you need help.